If there’s one thing that gets motorcycle riders – and Motorcycle.com readers – worked up, it’s the debate about whether a three-wheeler is considered a motorcycle or not. If you’re one of the haters, this news might brighten up your day: Campagna Motors, the company best known for producing the T-Rex, is shutting down. To all our customers, dealers, fans and friends out there. It will have been a pleasure and an honor to work with you, to serve you and to spend the last 15 years of my life in this amazing adventure. It ends here and now for me unfortunately. I will be moving on in my life but from what I know today, I am hopefull that the next owers of this venture will continue to innovate and create the exceptionnal product that we have been making since 1988. Interestingly, while Morissette says he’s personally stepping away, he seems to strongly hint at the possibility of new owners and investors picking up the Campagna pieces and continuing the company. 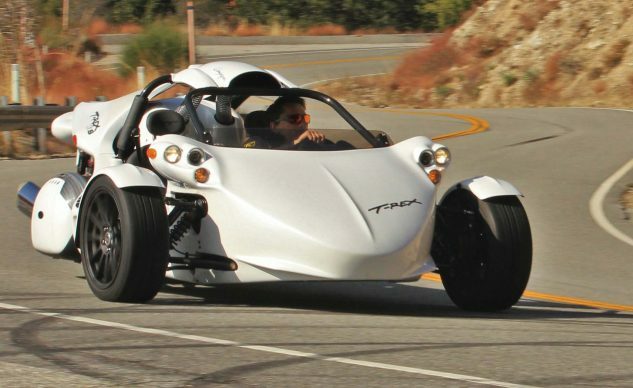 Whatever your stance on three wheels is, we’ve personally enjoyed our time testing the T-Rex 16SP, T-Rex 16S, and V13R (even if former E-i-C Kevin Duke doesn’t think these are motorcycles). They provide a fun and rare experience for thrill seekers who want to step away from their cars, but maybe have no interest in maintaining their own balance on two wheels. Seeing another company in the powersports industry go under is never easy to swallow, and from the sound of things, it appears as though we may be hearing the Campagna name again in the future. Here’s hoping this is the case. Get price quotes for Campagna from local motorcycle dealers.